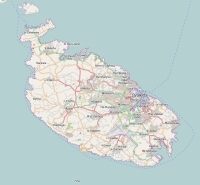 The inhabited large island of Malta is part of (the island group) Malta - country and is located in the country of Malta, Southern Europe. The distance to the mainland is about 246 km. The nearest (main) land is Italy and is not the country to which the island belongs. The surface-area of the island is 246.7 km2 and is therefore 0.65 x times greater than the island of Isle of Wight. The island lies in the Mediterranean Sea and the total coastal length is about 155.1 km and the dimensions of the island are approximately 28.4 km by 12.7 km (maximum width). The island is Northwest - Southeast oriented. The highest point is 249 meter and is named Dingli Cliffs 249 meter. The coordinates (latitude, longitude) of the island (center) for GPS are 35.89 (35°53'17.6964), 14.44 (14°26'24.4464). 1) Islands of St. Paul Located 8.1 km NorthNorthWest of the island. 2) Comino Located 15.7 km NorthWest of the island. 3) Gozo Located 23.3 km NorthWest of the island. 4) Linosa Located 144.3 km West of the island. 5) Lampedusa Located 176.6 km WestSouthWest of the island. Note: The information described below is partly subject to change. The island is directly accessible from Western Europe by plane. An international airport is present on the island. There is a ferry connection for cars to the mainland. For pedestrians, there is a ferry connection to the mainland also. Far as is known, there are good cycling opportunities on the island.